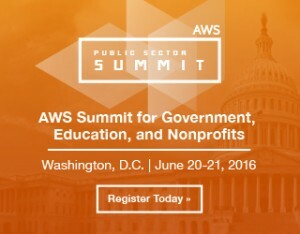 While this event is focused on the public sector, AWS is able to pull from their large commercial base to include stories and best practices from the private sector that directly apply to government missions and challenges. This year's event will feature AWS CEO, Andy Jassy, as a keynote, marking the first time he has spoken to such a large public sector-focused audience. In addition to Jassy and other AWS speakers, the event features customers and partners sharing their insights and demos. The event includes business and technology topics making it applicable for CIO and IT leaders, as well as the operational business leaders of government, education, and nonprofit organizations. We spoke with Tricia Davis-Muffett, Global Public Sector Marketing Leader for AWS, to learn more about how this event comes together. Q: Cloud is such a broad topic with a lot of nuances. How do you decide on the topics for this event? A: We work directly with our customers to understand what matters most to them, what they are asking about, what their challenges are, and what would help them in their day to day jobs. We also work with our best technologists to make sure we're highlighting emerging technologies and new offerings. While this is a public sector conference we also look to commercial sales and support teams to see what the trends are in other markets and how we can tie back lessons learned and best practices for our public sector customers. Q: How do you attract your speakers? A: Contrary to popular belief, government speakers are not shy about sharing their stories. [Tweet "Contrary to popular belief, government speakers are not shy about sharing their stories. #GovEventsBlog"] They are looking for the right platform to present their best practices and innovative approaches and open a dialogue with peers. We work with our customer speakers to make sure we position them on the program where their experience will have the most impact. Q: Which session or track are you most excited about? A: Security, governance, and compliance are all top of mind for our audience. We'll have the FedRAMP director, Matt Goodrich, talking about the next evolution of that program, FedRAMP 2.0. We have some unique sessions focused on innovating for the public good and public private innovation. We'll have a number of presentations on how state and local organizations are integrating IoT and mobility into how they are moving their cities forward through technology. Q: How are you using social as part of the event? Twitter is our core platform for social. We're using both the @AWS_Gov and @AWS_Edu handles to promote the event and get conversations started before attendees step in the door. At the event, we'll have a social media center and will be live tweeting the sessions (you can follow along with #AWSPSSummit). We also have a mobile app which we encourage attendees to use to view the agenda, get announcements, and connect with partners at the event. For more information or to register, check out the event page on GovEvents. This entry was posted in Event News, Gov/Mil News and tagged Cloud, FedRAMP, Security by Kerry Rea President of GovEvents. Bookmark the permalink.